This collar provides partial immobilization for use in soft tissue damage. 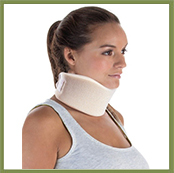 Ideal for cervical spine immobilization and extraction. These are commonly referred to as neck braces because they are used to partially or completely immobile a patient’s cervical vertebrae, which all form part of your neck. They are used after a patient has had a ‘whiplash’ injury or when a patient has fractured one of the vertebrae in their neck. The severity of the injury determines the degree of motion restriction that is required. 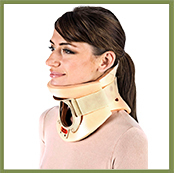 Neck braces are also used to partially immobilise a person’s neck if they have strained a muscle or ligament in their neck (soft tissue injuries). Thus, the most common use of these braces is to relieve pain, it helps your neck support the weight of your head while the soft tissues in your neck have a chance to heal.